PenguinSix | A guy who has 36 pairs of identical socks because he's figured out the meaning of life. “Why would you need a bike that can go 100 mph?” we asked curiously, looking down at this pile of rusted metal. The guy was slightly unhinged, but eventually, we sussed out of him that he was indeed going to be in some auto thrill show and intended to be towed behind a drag racer at crazy speeds. At least that’s what he believed (like I said, he was a bit off). He did give us $100 cash that he said he got from the promoter. Tomorrow I have 11 kids coming over for a baking party. It will be nuts. Here is the family Christmas Cookie (Anise Cookie) recipe we’ll be using. 1) Use softened butter in sticks. Let it sit out awhile or nuke it 20 seconds (do not melt). Mix the butter and sugar together quite well in a bowl. 2) Add and mix milk/soda, egg, Anise, and vanilla. 3) Add salt, cream of tartar, flour. Mix the dough so it is mixed and ‘rollable’. Cut the cookies with cookie cutters or with a knife to make the shapes you want. Reroll unused dough until you have no more (p.s. I eat the dough but it is very sweet). Bake on an ungreased cookie sheet (nonstick ok) at 400 degree for 6-8 minutes–basically until the bottoms start to turn slight brown. Do not overbake. You can underbake a bit (say 5 minutes in a very hot oven) but make sure you let cookies set a minute or two before trying to remove them from the pan (or they may break up). 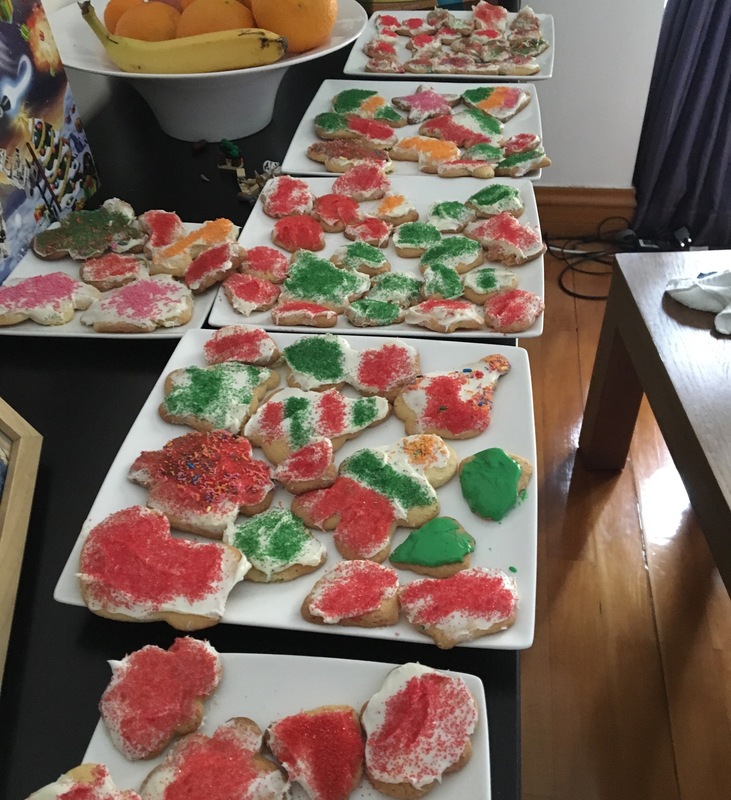 Use store bought frosting (I used Duncan Hines–worked fine) to cover them and then colored sugars to decorate. Store in a ziploc bag to keep the freshness as they do harden quickly. 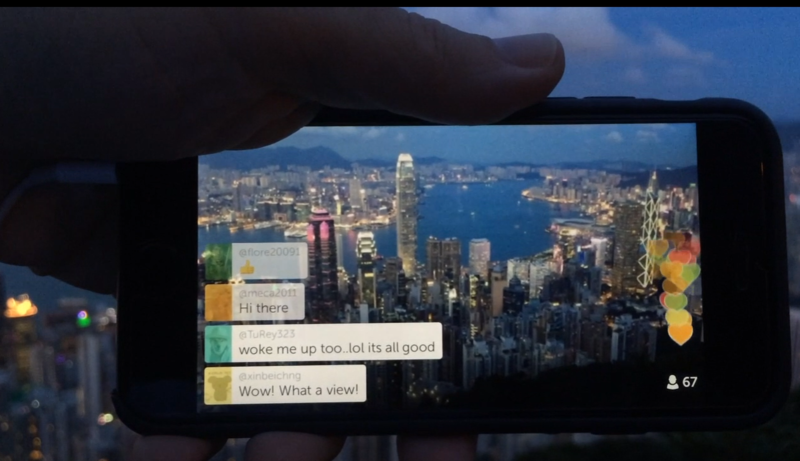 Periscope’s new functionality could spread to Twitter and reinvigorate the struggling social media giant. Let’s face some facts. Twitter, and thereby by extension Periscope, have a rough road ahead. A series of high-level departures at Twitter and the more recent general overall layoff of employees makes people question what will happen to Silicon Valley’s “diamond in the rough” tech company. The attempted shopping of Twitter failed for various reasons, reportedly due to the cost and the nature of product (Disney et. al. doesn’t want anything to do with trolls and hate speech, etc). Vine, one of Twitter’s high-profile acquisitions was also shuttered this weekend, leaving millions of social media posts and users in a state of limbo. But just this week, Periscope took a step toward what could a brand new and exciting path for Twitter. Something that could rewrite the ways in which Twitter content is displayed and shared, and lead to a massive improvement in the product and strong growth with new users….should the parent company consider following this lead. One of the problems with Twitter (and social media in general) is the signal / noise ratio. Following your Twitter stream for insight into Politics or Technology or virtually anything else results in a number of messages (and considerable time) sifting through extraneous and unrelated content. It is possible to create lists of followers that tweet about specific content, such as a list of Football twitter users or technology tweeters, but even then you still have to sort through other content that is not relevant. A hashtag based search can result in 100s of duplicate messages as retweets and other posts of the same content get caught up in the more general search parameters. These consumer-based curations of relevant content are still fraught with far too many false positives. However, Periscope’s new group-based broadcasting system offers something unique and new to this dilemma: Producer-based curations. Periscope has introduced “groups”, a method by which a social media creator can share content with a specific more granular group of followers. A content producer can create a group of users, say “Personal Friends” or “Subscribers (should a pay-to-view system develop one day). Groups can be built around interests, such as “tourist and travel followers” or “technology fans” such that Periscopes being created can be pushed to those users who have the most interest and are most likely to appreciate the content. Periscope groups are thus showing a way forward for Twitter to escape the 140-character rut they find themselves mired in for going on the Nth year. People have been asking for the capability to broadcast to specific groups for years, but Twitter has left Twitter lists as a “read only” functionality; you can see all the tweets from a list buy you can’t communicate directly with that group. Periscope groups will demonstrate that you can push content to certain users on certain subjects and that there is a market for this more detailed and specific sharing of social media. This offers a tremendous future for Twitter. A way to grow their platform from beyond that a 140-character service but into something far more useful to creators and consumers. Broadcasting to groups, and conversely, the consumption of specific content from a group of users is a very exciting development in social media. Twitter should seriously consider not only following the Periscope group concept but taking it a step further to create a more flexible “following” option. You would have the ability as a consumer to follow people only for certain types of content. As a producer you would have the option of sending content to everyone or to only those users who will find it of most value (Periscope-like groups). Conversely, a creator could send their content out to a group, such as:. Twitter would thus become a multi-disciplined social media platform, where you could still get the 140 characters of wisdom from people but also get new types of social media content as it becomes popular, be it photos, video, live video, or whatever else Twitter acquires in the coming years. Greater curation tools on both the creator and consumer side would render Twitter far more valuable to users. The platform would be set to add new features as they become available, bringing more and more people back to Twitter every day (hour) for more and more types of content without getting lost in the signal / noise conundrum of drinking from the social media firehose. Twitter has recently shut down the (once) popular VINE platform that they acquired only a few years ago. Without a doubt the VINE integration with Twitter was poorly handled. Getting “Vide’d” is now a verb amongst content producers who are very wary about putting time and effort into a platform only to find it getting nixed with a corporate reshuffle of the parent company. A very scary lesson for anyone involved in Periscope at this time. 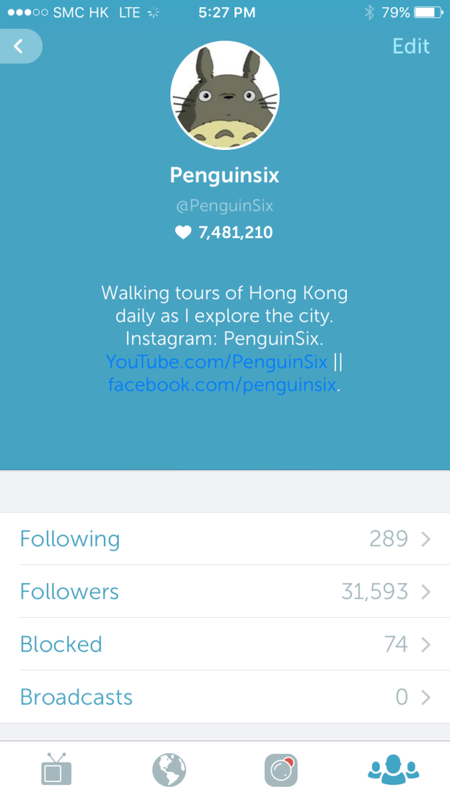 A system like this could have saved Vine (and could save Periscope). The existing subscriber base could be ported over to the Twitter in a flexible following platform after integration, such that if you currently are following someone on Vine or Periscope, your Twitter would now have a separate list of people you following only for videos (Vine) or live videos (Periscope). Twitter and Periscope creators would thus have access to a much larger potential pool of viewers as the sheer number of Twitter users would be now be more engaged in the Periscope system. Social media has gotten stale. Into this fray we now have what some might see as an even more mundane concept–live streaming of ordinary people. Periscope and Facebook Live now give the power of any person to turn a camera on and have an audience around the world. The beautiful and the banal, the majestic and mundane can now be streamed 24/7 live from any place on earth, well anyplace with a good enough mobile signal. So why is it that live video streaming could be the revolution that Social Media really needs? The problem with social media, as understood by the public relations departments of most major companies and social media ‘stars’ is that they aim rather low. They seek to have a “conversation” and then love to talk about how the conversation is leading to engagement, but “engagement” is a rather hollow concept and many traditional measurements of ‘engagement’ are as useless as ‘eyeballs’ as a metric. It may be a quantifiable (and billable) number, but does it really matter? Into this landscape comes Periscope and a host of other live video streaming services. Live, raw, unfiltered views of the world from ordinary people communicated out to waiting eyes and ears. 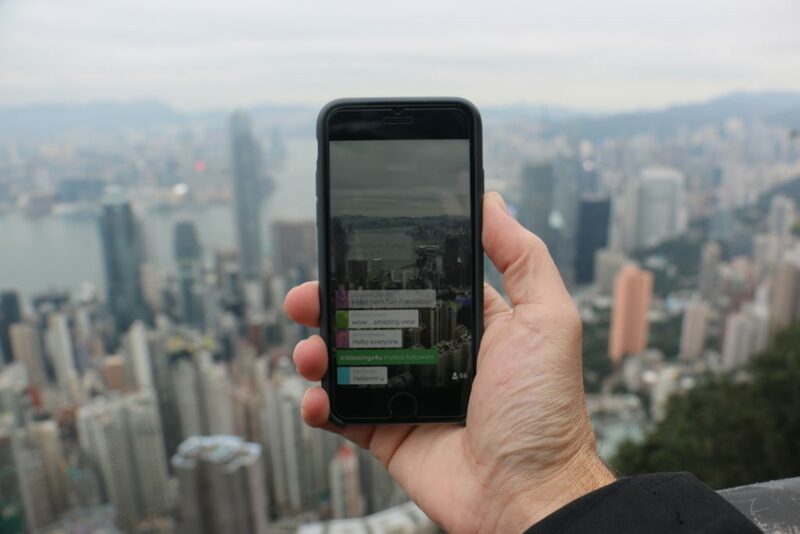 With a motto of “See the world through someone else’s eyes” Periscope has millions of producers around the world sharing their slice of life to a waiting and eager audience. And while it, at times, has dropped in the banal and boring, there is something else going on that is worthy of note. Despite some feeble attempts to script and control the narrative of a live video stream by some broadcasters, the end users of live video actually have far more control over the conversation than most public relations professionals would ever allow. Discussions overlaying the presentation can go on tangents of their own, and users can often stray the conversation off the intended course and subject despite the best efforts of the broadcaster. The conversation can turn directions and spin and it takes a steadied broadcaster to keep it on focus and moving toward the real goal. It is this ebb and flow of conversation that offers the best opportunity for social media in its history. Understanding comes when you see the world through someone else’s eyes and UNDERSTAND why they see it a certain way. A person who watches a live video experiences the decision-making process of another person first hand and begins to UNDERSTAND why they turned this way or that, why they eat this or that, why they buy this or that. When a person is given the chance to see things live as they occur, and occasionally even take part in the decision-making process of that individual or guide a conversation a certain way, that person develops a much greater understanding of what is going on, and a greater respect for the other person. The empathetic instead of voyeuristic reading of “See the world through someone else’s eyes” is what offer the greatest potential for live video to rule social media. A person who listens and understands is someone who has learned something and may alter their own behavior to that in line with that understanding. A myriad of choices, from political decisions to simple mundane tasks can be altered when an understanding consumer of social media makes their own decisions with the views of another person in mind. It also leads to a tremendous marketing potential in that a person who understands why they should do something a certain way become a consumer who will perform that way without additional influencing. It’s one thing to have a conversation with a person and say to them “I really think you should buy this product” but it is something far greater, and more valuable, to have a person say “I understand why I should buy this product and will buy it myself, now and in the future.” Getting to this level creates a consumer FOR LIFE, not just for one transaction. While difficult to quantify, the empathetic consumption of live video can truly be the revolutionary social media development of the next decade. Or it might just end up as an updated version of Chatroulette… (more on that in my next post). An interesting tidbit for the English-speaking world is that the opening ceremony of the 2016 Rio Olympics will feature the countries taking the field in alphabetical order, but by the Portuguese spelling of the nations. As such some countries, like the United States, which generally enters toward the end of the parade, will find themselves entering early on during the event with the ‘E’s under Estates Unidos. This has even led to the US television networks asking that this be changed, as they fear American TV audiences will quickly turn the channel after they see the American team enter the stadium. Something similar happened in Beijing where the teams entered by ‘stroke’ order of the Chinese alphabet. In case you are wondering, the USA will be wearing Ralph Lauren again this year. For a full list of nations in the order they enter, take a look here and plan you viewing accordingly. 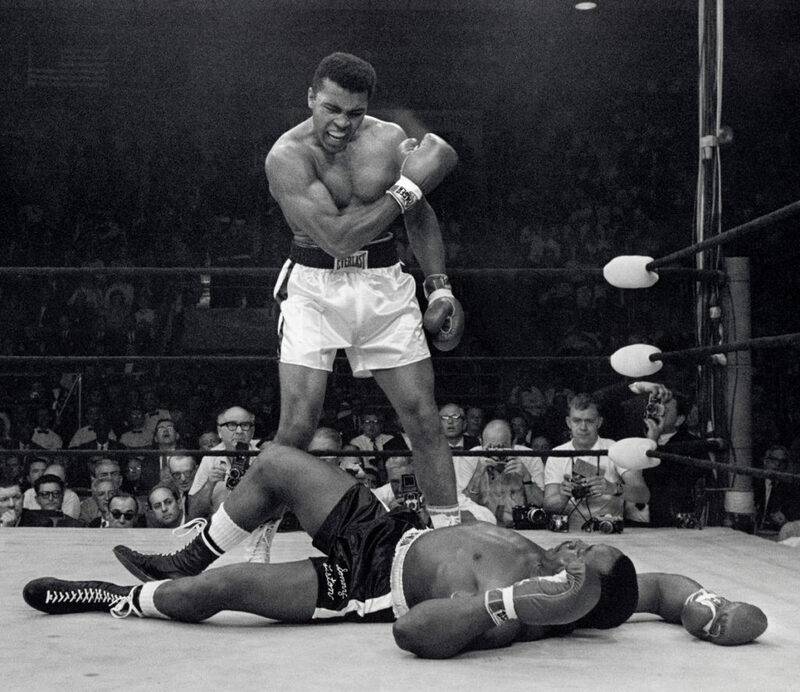 The day I met…well, saw Muhammad Ali in person. One of the annual charity events at the University of Notre Dame is the Bengal Bouts, a boxing match where “strong bodies fight, that weak bodies may be nourished.” Money raised from this boxing tournament, a sport organized at Notre Dame by the legendary Knute Rockne, is sent to help feed people at a mission in Bangladesh. While I was a student in law school one of my fellow classmates was boxing, and we went to cheer him on to victory in his bouts at what was the first (and only) boxing event I ever attended. Little did I know when I went to my first boxing tournament that later that week I would come across “The Greatest”. Muhammad Ali actually lived very near to the campus of Notre Dame in nearby Berrien Springs Michigan. Some of my friends at the Bengal Bouts said he occasionally would come by to watch the Notre Dame students boxing, and there were others in South Bend who reported seeing him from time to time. We were sitting around the library (as is the case in law school) when a friend came in and said “we just saw Muhammad Ali at the Barnes and Noble.” In little need of a distraction to pull us out of our books, we hopped in a car and drove over the bookstore to see if it was true. Sure enough it was. Once we arrived we were shocked by a line out the door. Apparently he was there to release a new book, and many people had come to see him in person. We made our way in the side (we told the staff we were going to buy something else) and we made our way back to where he was holding court. My first impression was “this guy is huge”. On paper he is 6’3″ (198cm) but he seemed even bigger, especially with the build of an ex-boxer. He was surrounded by handlers, but there was an orderly line of people coming in to see his book and to meet him. Fellow college students were there in a group, gathering around him to get their pictures taken. Families, some in their Sunday best, had come as well and circled around for a photo that I’m certain still hangs on their wall. And then there was this one guy who looked really out of place. . .
A skinny white guy, replete with a scraggly beard and baseball cap and wearing blue jeans with a flannel shirt was patiently waiting in line behind the giggling college kids and expectant families. He wasn’t holding a book nor was he carrying a camera, and in another time people would look at him and think ‘this is the kind of guy that joins the Klan’. When the man’s turn came up, I could see some of Ali’s handlers tense a bit. The man walked up, held out his hand, and said a few words to Ali, who grabbed his hand with both of his and shook it back. Ali smiled, the man smiled and started to walk away. Ali was a bit surprised and motioned to him as if to say “don’t you want a picture?” The man just said “No, I just wanted to shake your hand. I’ll remember it”. It was a pretty interesting moment for me as well. I was but a child during the Rumble in the Jungle and the Thriller in Manila, but I remember the time and the stories about him dealing with Vietnam, racism and his religious views. He was definitely capable of crossing over many different racial and religious lines to make an impact on many different people. My one run-in with him just reminded me of that fact. Radio is dead. I mean when is the last time you heard something “new” that wasn’t a) a ‘new’ version of an old type of music you’ve heard from artists you know or b) so ridiculously new it sounds like it should be in a experimental “gender theory of expressionist music” class at university? Thank god for FIFA 16. 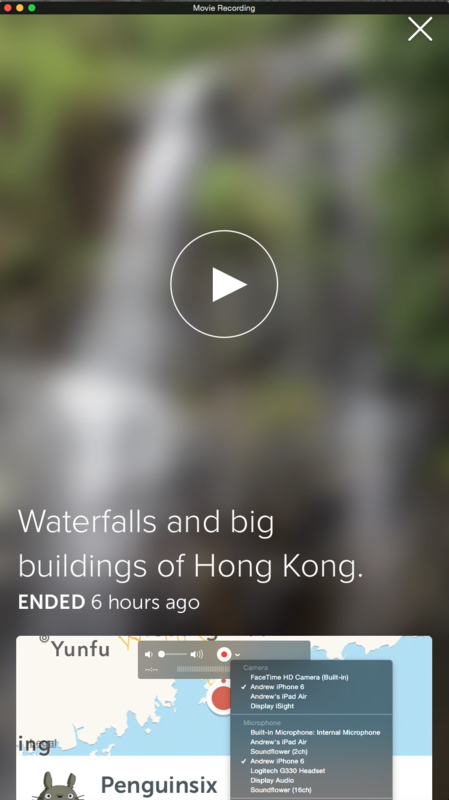 I really have no idea how many hours I’ve spent making videos with the new app called Periscope. It is easily in the hundreds, as I have been making videos since the first day of the public release and now have over 31,000 followers. It seems so easy, possibly a throw back to the 1970s when every bank had a blinking time and temperature sign, but probably the most asked question I receive is “What is the Time” and “How it the weather?” A new update for the iOS app has added time to the map, but personally I’d prefer it on the main video, perhaps as a 10 second overlay every so many minutes. Just a little time and temp ‘bug’ that pops up on screen or in the chat to save me having to be a weatherman and a clock every few minutes. I spend an inordinate amount of time re-answering the same questions day after day. “What do you do?” “How old are you?” “Why did you move there” etc. It’s gotten to the point that even some of my regular viewers can answer the questions should I not notice them. What would be really helpful would be five buttons on the side of my screen or appearing through a ‘long touch’ that would pump into the chat preset answers or statements from me to my community. If I could save short amount of text as a preset answer I could just click ‘1-2-3-4-5’ and focus more on being alive and less on repeating myself. Facebook Live has a new feature that Persicope needs. The ability to put a broadcast on ‘pause’ when someone calls in on the phone. It is absolutely frustrating when you have a good Periscope underway only to have a phone call come in and disrupt or disconnect the stream. A pause, perhaps with a little “telephone icon” appearing on the screen would be a wonderful addition. When comments are fast and furious, or when a broadcaster is walking down the street, it’s incredibly easy to ‘miss’ a comment as it has faded or passed from view before you had a chance to react. The ability to scroll back even only 5-10 seconds would be a welcome addition, as a broadcaster could go back and see a comment even after it has faded from the screen. A swish down over the chat to pull up the last few comments in a conversation would be quite helpful. At present to follow someone on Periscope you’ve got to slide the screen to the left (1), tap the profile (2) and then hit the follow button (3). This three step process was designed to prevent accidental follows, but has had the effect of making new subscriptions difficult and even confusing to new users. Broadcasters have to explain several times through a broadcast how to become a follower. “If you would like to follow, please slide left (or up for Android), tap my profile, and then click the follow button”. As Periscope grows into the professional world, the demand for detailed analytics will rise. How many users is great, but when are they watching, when are they turning off, how did they find my scope are all questions most other social media sites can offer their content creators. From a regular broadcaster perspective, some interesting additions would be something like “how many new people in the last five minutes”. I frequently do a broadcast that will hover around 100 people, but what surprises me is that very few of the 100 people at the end are the same 100 people that were there at the beginning. People come in and out, thus requiring you to re-answer some simple questions, but you often don’t how many are new and how many are the ones who have stuck with you from the start. Some sort of system where you could tell how many new watchers you have in a scope would be quite helpful. I’m spoiled by 4k. Well not even 4k, but by 1080p at 60fps. The image quality of today’s phones is getting better and better, but due to the nature of live streaming of an HD signal is probably a monstrous bandwidth hog. Speak of hogs, here is a great example, I came across a breaking news story of a wild pig running amok through Central Hong Kong. The footage from my chase was used by the Guardian and the BBC, but unfortunately, the quality of the video was somewhat subpar vs. what I could have recorded in 1080p. If there is the option for a high quality video upload after the broadcast had ended, this would be a great addition for Persicope to roll out, especially if Periscope migrates toward longer playback and storage of previous scopes. Note I’m not talking about a delayed update like we used to have with the app, but an upload of a full 1080p version of the Periscope (though I suspect this might prove a tremendous technical difficulty with one version of the video being saved at 1080p and another being streamed at a lower bit rate, all on the fly at the same time). Overlays have become part of the standard television and even Youtube broadcasting environment. The ability to display and rend graphics on the screen while broadcasting is now available in even the simplest free broadcast tools. 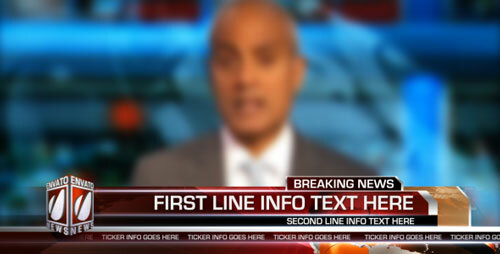 Adding some functionality to have an overlay of an image or even a ticker would be something some broadcasters, especially the professional ones, would find quite helpful. “See my lunch of noodles in Hong Kong” is an interesting title, but after starting a broadcast and getting a good crowd I generally don’t like to hang up on them as I leave the restaurant and go run my next errand. In fact broadcasts over 5 minutes rarely stay on the same topic as the original title. 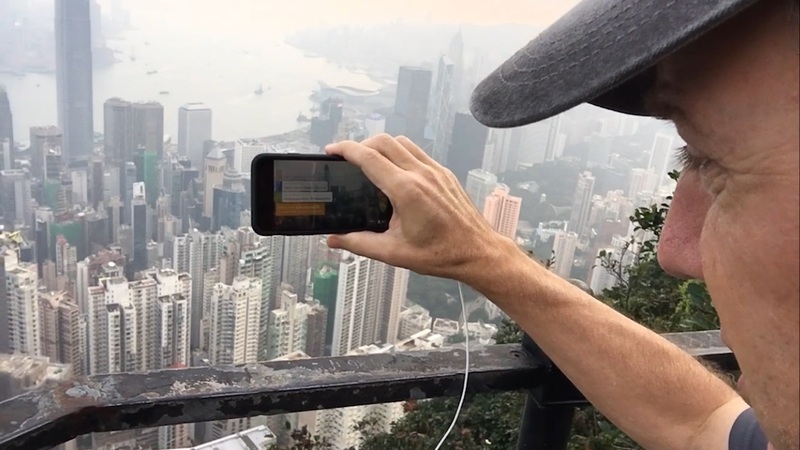 A Periscope starting on a mountain path could easily end up on a city sidewalk. A conversation about movies could change to politics. New users see a title and come expecting a noodle lunch or a conversation about movies and quickly get annoyed when they discovered the “missed that” part earlier. Giving the user the ability to keep his existing community and conversation ongoing without having to endure new users coming in expecting something else would improve the overall experience. And that’s enough for now…. I took the kids out the other day for a photo walk, trying to teach them some principles of street photography by walking around the city and observing all there was to see. So we walked through the wet market in Hong Kong, where fish lay on the boards before being cut, pieces of meat hang from dirty hooks cut by men with a cigarette behind their ear and a cleaver in their hands. Noodles are stacked high and stretched long as they are made in the shops and sent to restaurants nearby. Neon lights calling out for everything from foot massages to yummy bakery goods, which also filled the air with the sweet smell of freshly made treats. And after nearly 20 minutes of this, my boys had yet to take a single picture. “Well yeah dad, we see this everyday”…. It was then I realized my kids really do call Hong Kong their home. But for me it is still rather unique. So I’ve decided to start some Youtube videos of the “everyday” that we see here in Hong Kong. 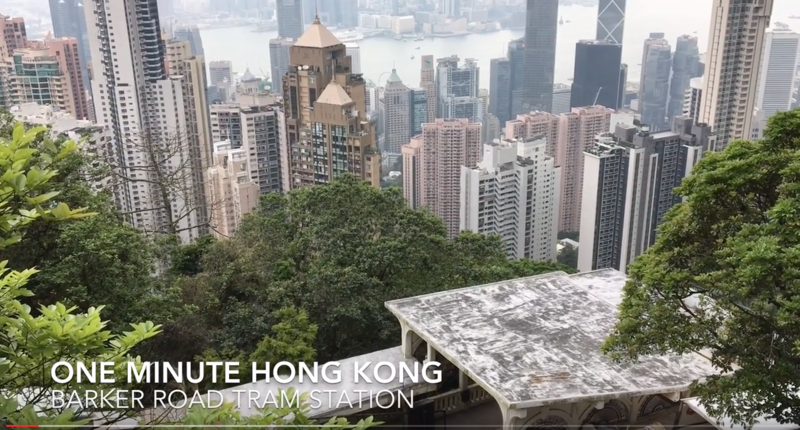 My new set is in a playlist on Youtube called “One Minute Hong Kong”–one minute snapshots of life from the city I now call home. 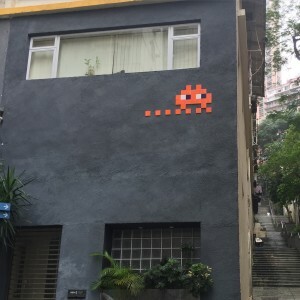 The French street artist INVADER has come to Hong Kong several times, but this last month he came ‘officially’ as part of an organized show at the PMQ gallery. There his works hung on well lit walls with tour guides and a gift shop, but that doesn’t mean he wasn’t busy again on the streets of the city. 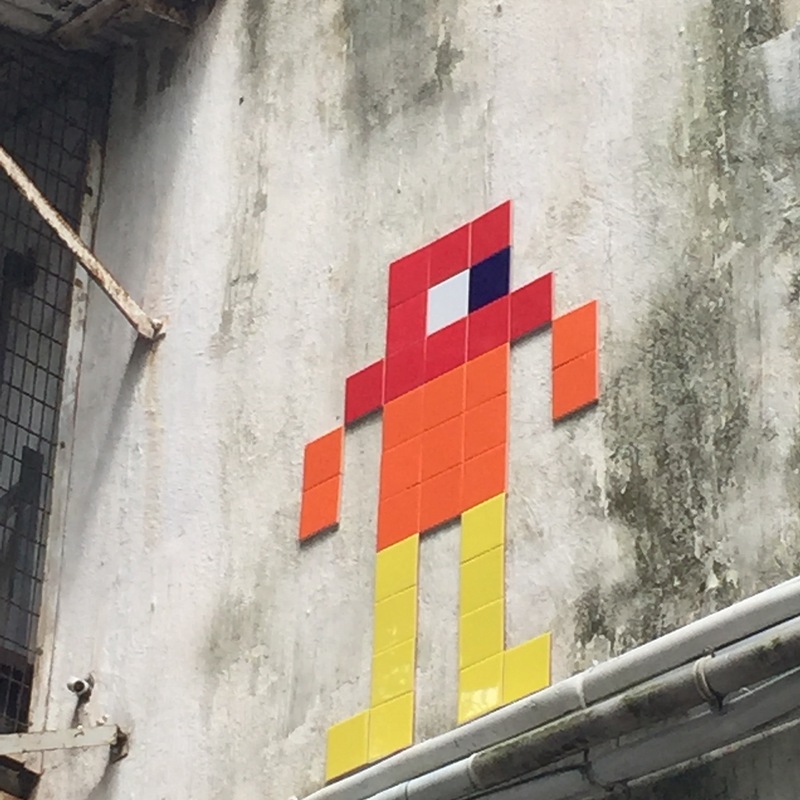 INVADER launched a new wave of art on the city streets, and my kids took an immediate liking to finding every single one of them. The other day we did a city hike through the streets of Sheung Wan and managed to locate about 7 of the 20 or so new works with several more now on the agenda for our next hike. 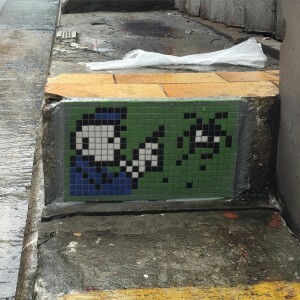 As if that wasn’t enough, the kids are now trying to recreate as many Invader works as possible, along with a few original designs of their own. 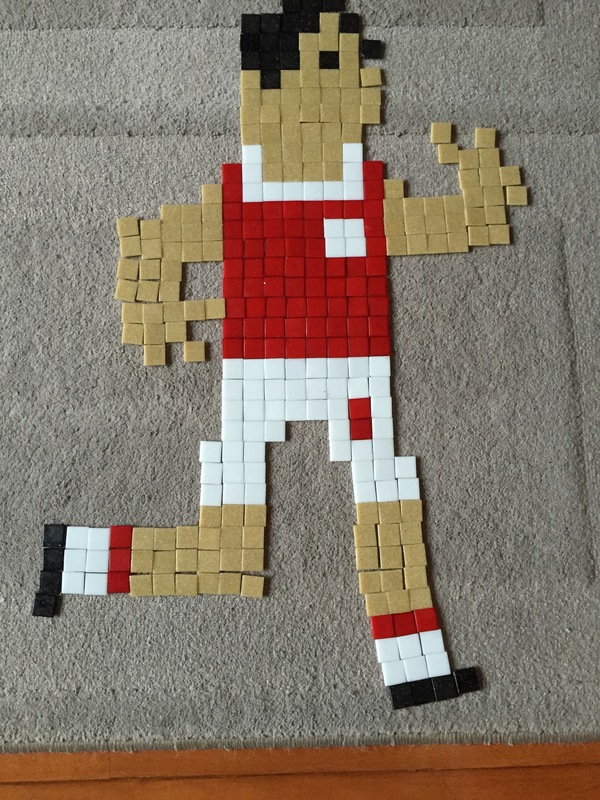 Arsenal man was a big favorite, and the boys are already asking how I can attach it to the wall. 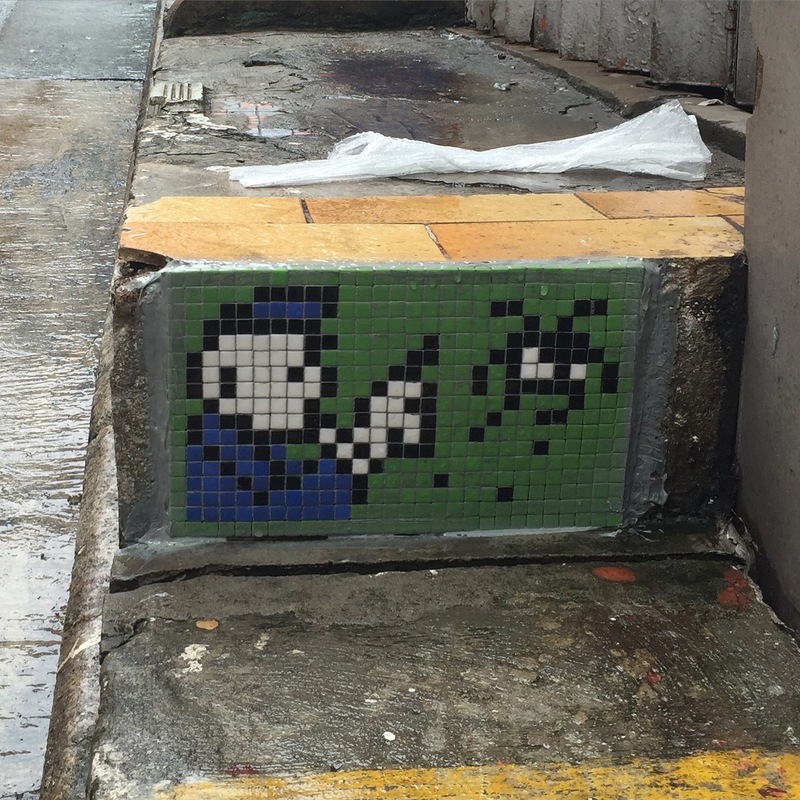 Thankfully they don’t know what grout yet, so we’ll make do with something a little less permanent. 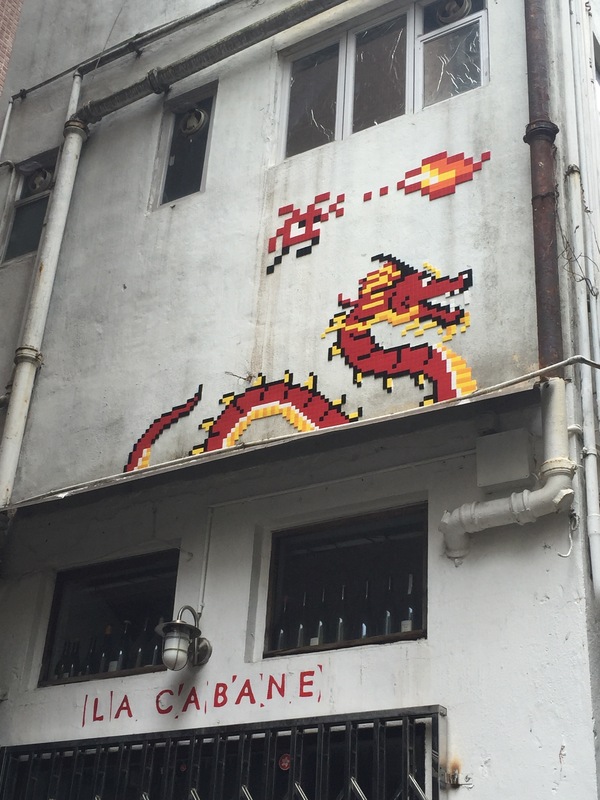 I created a Google Doc with a location list of all INVADER work in Hong Kong that is still visible, but haven’t gotten around to finishing the map just yet. 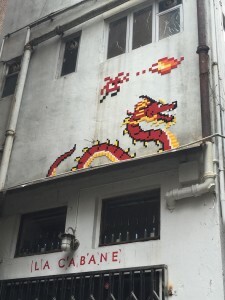 Feel free to take a look and follow the invasion around the city. 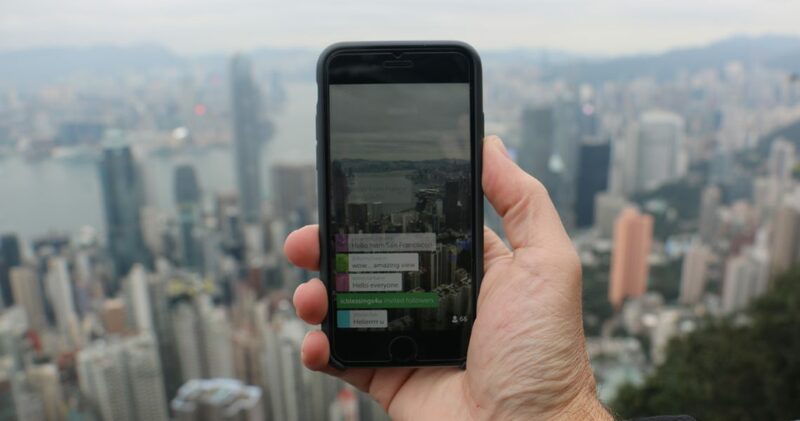 How to record a Periscope video with comments. Periscope is a new app that is creating quite a bit of buzz and a great amount of content from users all over the world. Everything from views of Paris to views of a refrigerator in Turkey is fair game for the content creators around the world, but this content has a very short lifespan. 24 hours after any broadcast the videos are destroyed. You have the option of saving the video on your camera, but it doesn’t save the comments which leads to a video of you answering questions that the viewers did not see, creating a confusing commentary track. But with a simple free program already installed on your Mac, you can capture and record your Periscope videos with comments. All you need to do this is to plug your phone into your computer and follow these simple instructions. A new movie window opens. Click on the prompt next to the record button to get an option of input sources. You should see your iPhone listed both under Video and Audio. Make sure those are selected. You should know this is working when you see your phone’s screen on your computer. Open up the Periscope App on your phone and go into your profile to find your more recent broadcasts. Select the video you want and start playing. Click the record button on Quicktime on your Mac and start making a screen capture of your movie as it is playing on your phone. Finish and save and do with it what you will. NOTE: I don’t know if this works on older model devices–I’ve only used it on an iPhone 6 but it should work on an iPhone 5 as well. My kids have decided to become Youtube stars. Needless to say they still need some work. Hong Kong, with 7.2 million people and a FIFA ranking in the 100s or so is nowhere near getting into the World Cup Finals this year, but it got me wondering if it is just a matter of not enough people to field a team or something else. So I did a bit of Googling and came up with this list of countries in the World Cup finals, ranked by population. Would be interesting to do a list of countries by number of soccer pitches. I think HK would be at the bottom of that one, probably even behind Vatican City and Monaco. 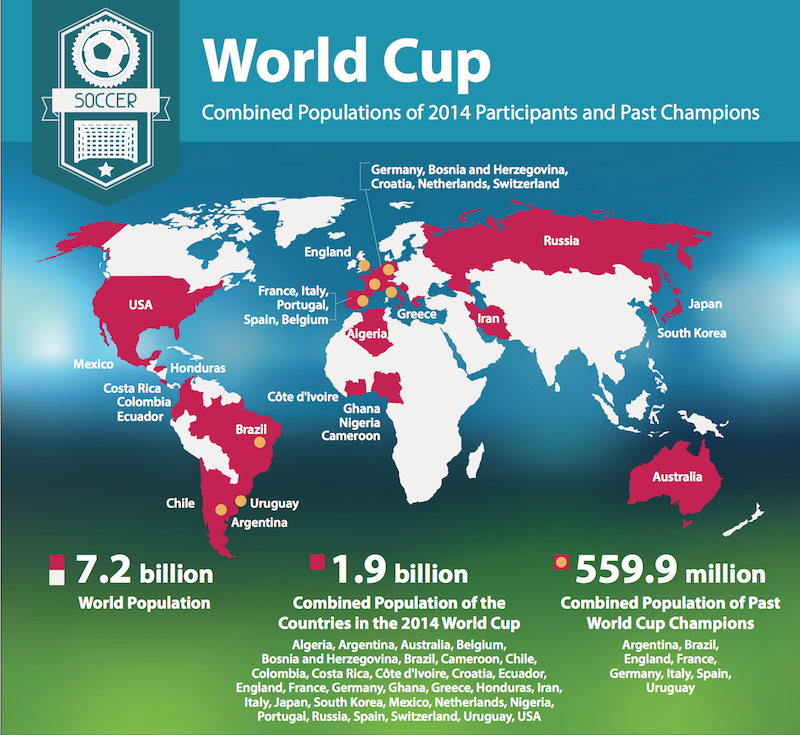 The US Census did an interesting graphic on the World Cup and population. Let me see if I can get that in here too. Wow, things can get quite complicated in the World Cup in just a matter of seconds. With the USA losing a win in the last seconds, the scenarios for tiebreakers in the next round are quite complex. Using this guide of World Cup Tie Breakers, I’ve tried to summarize the potential scenarios for each team. This is a work in progress so if I got it wrong expect an edit or update. Germany loses, and Portugal or Ghana do not win by enough to overtake Germany on goal difference AND on total goals scored. Germany loses and Portugal wins and all other tiebreakers are equal, Germany would progress on the fact they already beat Portugal. Germany loses and Ghana wins and all other tiebreakers are equal, then they would flip a coin. USA loses, and Portugal or Ghana do not win by enough to overtake the USA on goal difference AND total goals scored. USA loses and Ghana wins and all other tiebreakers are equal, the USA would progress on the fact they already beat Ghana. 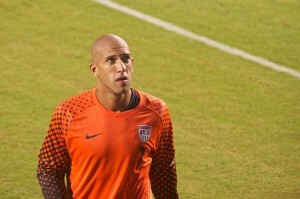 USA loses and Portugal wins and all other tiebreakers are equal, then they would flip a coin. Ghana wins and the USA or Germany loses, with the change in total goals scored enough to overtake the losing USA or Germany on total goals scored. Ghana wins and Germany loses and the tiebreakers even out and Ghana wins a coin toss. Portugal wins and the USA or Germany loses, with the change in total goals scored enough to overtake the losing USA or Germany on total goals scored. Portugal wins and the USA loses and the tiebreakers even out and Portugal wins a coin toss.